VEHICLE	:	2 vehicles - 4 seats each - 8 passengers max. ACCELERATION	:	3.6 G max. 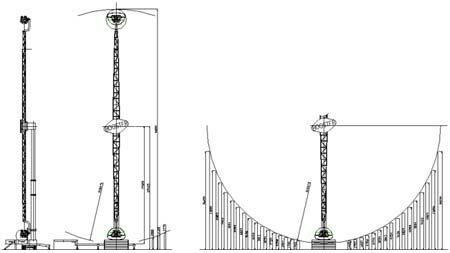 The stress analysis and designs of FC Fabbri Park “BOOSTER” ride are in conformity with DIN standards, and the electrical system is in conformity with EN-60204-1 standard. Upon request, the ride can be supplied with TÜV approval. The “BOOSTER” ride ride is made up of one column fixed to concrete foundation, two rotating arms are installed on the upper part of the column by means of a swinging bearing. At the extremity of each arm there is a four passenger ‘back-to-back’ vehicle, with dangling legs system. A parking brake allows safe passengers access to and from the vehicle. Every seat is provided with a safety shoulder bar with double restraint system, the shoulder bar is air operated. The arms rotate by means of two D.C. motors while the vehicles are free to rotate according to the speed and centrifugal force, they can perform a 360° rotation (loop). The vehicle speed is variable and can reach a maximum force of 3.6 G. The height and high speed are extraordinarily spectacular.